Colin Dale, born 1965 in Saskatoon, Saskatchewan, Canada to a Scandianvian father and artisan mother so he learned at an early age the importance of art and culture. Colin's parents were a foster family to special needs children (native Indian, handicapped, etc.) so he was already introduced to native culture, history and art as a child. Colin studied fine art and theatre in high school before travelling to Europe and Asia. He returned to Canada to complete a University degree in Fine Arts specializing in drawing and photography. It was during this time he became interested in Rock Art. Both the petroglyphs/pictographs of his native Canada as well as the "helleristninger" and rune stones of his Scandinavian ancestry. Colin re-immigrated to Denmark in 1991, where he pursued a career as a Graphic Artist and Medical Illustrator, before meeting Erik Reime. Colin's understanding of body musculature and love of rock art, fit well with Erik's artistic direction as a tattooist, and Colin was quickly taken as an apprentice at Kunsten pa Kroppen. After several years of learning the basic skills of hand and machine tattooing Colin began travelling again to destinations as far away as French Polynesia... exchanging and discussing techniques with tattoo masters from Borneo, Samoa and Tahiti. 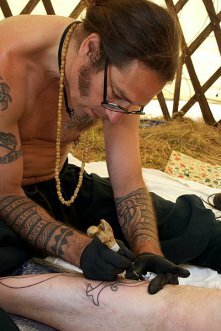 Colin's research has helped to reintroduce the lost tattooing techniques of the Nordic, Native American and Inuit cultures. His work has been illustrated in various books, magazines and documentary programs. After 12 and a half years, Colin decided to open his own studio/gallery, "Skin & Bone" on New Years day 2010... where he could provide a meeting place to share experience and continue to work alongside other ethnographic artists and tattooists from all over the world. Colin continues to travel and promote cultural tattooing throughout the world.